How did you do during the ice storm this week? We made a trip to the grocery store just before it came. 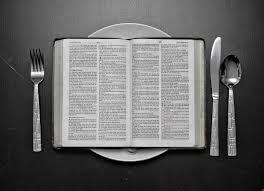 Christ says that we don’t just need physical food to live, but we need the word of God also. It doesn’t seem to take much work to eat a little ‘snack’ of the word on a wall calendar or in a mobile app. But how do we prepare a meal? How do we feed ourselves? This week in the Galatians inductive bible study group we began to practice the skill of ‘eating’ an entire chapter of the word of God. A chapter is a great size because it is not so small that we miss the context or the flow of the discussion. But it is also not so big that it is too difficult. We’re using the book How to Study Your Bible (printed in English and Spanish) as our training guide. Contact Jonathan if you want a copy. Remember to pray. Can any of us claim to be a perfect interpreter of anything? Is truth always easy to understand or apply? Why not begin by asking the One who gave us His word to help us understand and apply it? Keep the context in mind. The context of the chapter is the book. If you have time to read it, that will give you even more insight into how God’s truth applies to your life and the lives of those you love. Does the text answer any of the 6 basic questions? (who, when, where, what, why, how). Put on your detective clothes and develop a questioning mindset. Contrasting words and phrases, such as: but, however, nevertheless, etc. Expressions of time, such as: then, after this, until, when, etc. Terms of conclusion and result, such as: for, therefore, so that, etc. If it is a historical or biographical book, do some extra checking to learn about the time and place and situation (you may have to look outside the chapter for this). Check chapter theme with the rest of the book. Hopefully, you have had time to read the book in its entirety. Check how the chapter theme you are developing fits with the book as a whole. One of the easiest mistakes to make is in the next step: Interpretation. Whenever we start using language that is not taken exactly from the text of scripture we begin to interpret. Sometimes we are accurate, but sometimes we make logical conclusions that are based on faulty assumptions. So it’s not bad to begin to interpret, but we need to be clear in our notes whether we have a scriptural basis in that passage for our conclusions. What do I learn about God here? Does this passage point to Christ in some way? How do the realities of God’s character impact my life today?